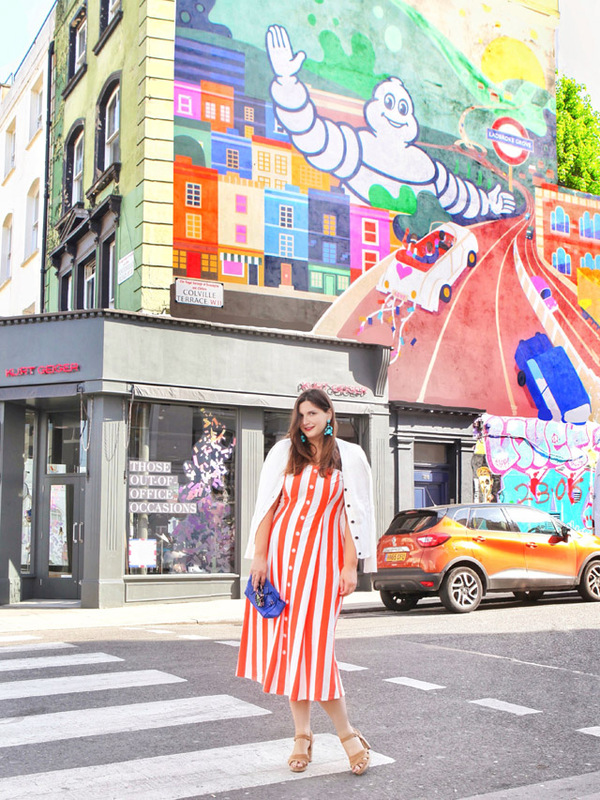 Style Update: The Deckchair Dress! If you're into your stripes, this one is for you. I simply can't get enough. Take one look in my closet and you'll think I was a sailor in my former life. I blame my New England parents and their preppy leanings. You can take the girl to the Southern states of America, move her to England, but never part her from her nautical stripes. Although, the retailer of this dress calls this a deckchair stripe. Fair enough. It does, in fact, closely resemble a deckchair one might find in Green Park on a hot summer's day. But I'm wearing mine out and about today in Notting Hill, while the sun is strong and the crowds are just starting to pile in. Nothing like getting out early in the morning to Portobello Road. It's a completely different place. Anyway, this dress is ideal for an hourglass figure. The soft cotton stripes are perfectly fitted to accentuate a beautiful curve. The dress itself is strapless, so I hope you own a good strapless bra, or just throw a cardigan over it, if you want some more full support with a regular undergarment! Happy shopping, ladies!